Vandals damage sports turf in LaSalle, Ont. April 5, 2019 – Landscape Ontario's Congress tends to get bigger and better with each passing year. It's not only the place to be for those long engaged in the landscaping industry, but for anyone thinking of entering the trade. April 4, 2019 – KIOTI Tractor is teaming up with 2014 Olympic gold medal champion curlers, Team Brad Jacobs, on a multi-year partnership, becoming a sponsor of the highly accoladed team from Northern Ontario. April 2, 2019 – The head groundskeeper at Boston's Fenway Park has written a new book that chronicles his experiences with post-traumatic stress disorder and serves as an inspirational story for others suffering from PTSD. The book, by David Mellor, is called One Base at a Time: How I Survived PTSD and Found My Field of Dreams. April 2, 2019 – Now that winter has given way to spring, British Columbia's Interior Health agency is warning the public to be on the lookout for ticks. The tiny insects are prevalent throughout the province's interior. March 29, 2019 – Triangle Park in Dayton, Ohio – site of the first ever National Football League game played in 1920 – is going to receive a new artificial turf field funded by the NFL Foundation. The field is expected to be completed in time to commemorate the league's 100th anniversary in 2020 and will feature a practice session by the Cincinnati Bengals. March 28, 2019 – Leaving a portion of a lawn unmowed can help return bee populations to healthy numbers, an ecologist for the Centre for Ecology and Hydrology in Great Britain says. Leaving some wildflowers and dandelions to grow to provide a food source for bees can help reverse the trend of declining bee populations, Dr. Helen Roy says. March 22, 2019 – A Smiths Falls, Ont. golf course is embracing the legalization of cannabis and relaunching itself as a pot-themed facility that wants to "bring the fun back to cannabis." The Lombard Glen Golf & Country Club is renaming itself the Rolling Greens Golf Club and wants to introduce live music and a drive-in movie theatre to the premises along with night golf, mini putt and frisbee golf. March 21, 2019 – Democratic presidential candidate Beto O'Rourke has been given a unique endorsement with his likeness carved into a two-acre field near an international airport in Texas. Earth artist Stan Herd created the piece of art the size of two football fields at a location clearly visible by planes taking off and landing. March 19, 2019 – The new artificial turf field at Cold Lake, Alta. 's Energy Centre will be put to good use this summer as the home field for the Alberta Football League's newest team. Constructed last year, the field will be home to the Cold Lake Fighter Jets' home opening kickoff on May 25. March 18, 2019 – A significant slash to the city budget in Winnipeg may have a notable impact on the city's future tree canopy, an editorial in the Winnipeg Free Press suggests. A 36 per cent decrease in deforestatation and urban forest enhancement will impact the city's efforts to save its North American-leading population of elm trees and will provide little help in the battle against the emerald ash borer. March 15, 2019 – The landscaper at Fundy's Cape Enrage in Moncton is the most sought-after person at the tourist attraction among visitors. Tourists target the employee, finding he is intriguing and is willing to answer questions about the local way of life. Municipal sports turf managers who know how their playing fields are categorized have a better chance to manage them more efficiently based on agronomics. By paying close attention to the root zone, sports turf can be better managed than by simply basing maintenance practices on usage time. Research at the University of Guelph into the potential of biosolids as a sustainable alternative to conventional fertilizer products has produced data that could be perceived as encouraging. Managing putting greens can be compared to running in a marathon. Golf superintendents must do as much as possible during the spring to “train” for the marathon that is typically “run” in July and August, and sometimes into September. Keeping up with worn goalmouth areas is typically the biggest challenge faced by sports turf managers on soccer fields. It’s the area of the playing surface that sees the greatest amount of wear, and keeping up with that section of the field is often a never-ending task. A three-year research program aimed at improving turfgrass in residential areas has concluded at the Vineland Research & Innovation Centre at Vineland Station, Ont. Best management practices for fertilizer application will differ from golf superintendent to golf superintendent, but it’s all about making the optimum use of available resources. These days, homeowners are being pulled in more directions than ever and their free time is increasingly precious. As they look at how to simplify their lives, more and more of them taking a long, hard look at their lawns – and gardening centres must therefore be ready with both good replacement options and good guidance. Oct. 2, 2018 – An opinion piece in the Vancouver Courier suggests it's time for city residents with synthetic turf lawns to do away with them and turn toward other natural alternatives if they don't wish to maintain a natural grass lawn. Understanding how fungicides work and knowing what part of the plant should be targeted will greatly assist golf course superintendents with their spraying programs, an audience of superintendents was told in March during a Syngenta-sponsored forum in Milton, Ont. May 31, 2018 – Landscape professionals may have more choices of plant material than they think. Many imported trees and shrubs care fare well when mixed with native species, adding diversity. May 17, 2018 – A Kitchener-area lawn care professional says aerating and overseeding lawns is an ideal way to choke out weeds, including dandelions. An a University of Guelph academic adds that regular fertility will produce the best lawns. April 11, 2019 – A Vancouver Parks Board commissioner wants to have a closer look at whether or not the city's municipal golf courses present the best use for Vancouver's park land. Vancouver's three municipal courses have seen the number of rounds steadily decline since the late 1990s. April 9, 2019 – A Winnipeg city councillor says taxpayer support of municipally-owned golf courses is an issue that needs to be explored. While the golf services financial report shows it’s breaking even, that’s only possible with an annual transfer from the city’s general revenue fund of $750,000. April 9, 2019 – The second phase of construction at Kelowna's Glenmore Recreation Park has begun. The second part of the project includes the construction of two multi-use sports fields that are expected to be completed by the fall. April 2, 2019 – The federal government is restricting the movement of all firewood out of Halifax County as a means of slowing the progress of the invasive emerald ash borer in Nova Scotia. Several trees have already been destroyed since the insect made its first appearance in the province last September. April 1, 2019 – Leaf and yard waste will no longer be accepted in green bins in the City of Hamilton, as of today. Such waste must now be placed inside a brown paper bag marked with a city yard waste sticker. March 27, 2019 – Esquimalt, B.C. is looking to give its sports facilities a multi-million-dollar makeover. The total cost of about 15 separate projects is about $17 million and would include a new artificial turf field at Bullen Park, upgrades to an existing field at the park and an outdoor track. March 21, 2019 – Puslinch Township in Ontario remains committed to having a new soccer field in the community by 2020 to accommodate adult players. There is currently no adult league in the municipality and existing fields have been turned into "mini" playing surfaces to accommodate younger players. March 20, 2019 – Although the migration of the emerald ash borer hasn't yet reached the City of North Battleford, Sask. and the threat of Dutch elm disease is medium to low, the municipality's leisure services director says a risk management plan needs to be in place to protect the city's trees against both threats. March 20, 2019 – The City of Guelph's new waste management bylaw means grass clippings will no longer be collected by the municipality. A recent survey showed 76 per cent of respondents agreed clippings should no longer be collected. March 14, 2019 – The Town of Redcliff, Alta. has agreed to loan $315,000 to the Riverview Golf Club to keep the golf course open. The club has faced financial difficulties in recent years yet members have been fighting to keep the facility open. March 12, 2019 – Kelowna's city council agrees that warnings and fines are warranted for anyone who allows his dog on the playing surfaces of Marshall Fields. Council has been debating for some time how to resolve the issue of off-leash dogs running on playing fields used annually by thousands of soccer players. March 8, 2019 – The City of Peterborough, Ont. has temporarily suspended its permitting process for cutting or trimming trees on private property. The bylaw that was enacted in 2017 is expected to be overhauled, but for now homeowners can cut or trims trees on their property without a permit. April 17, 2019 – Buyers Products, a leading manufacturer of work truck equipment, has introduced a new municipal flex plow. Operators can “flex” the upper moldboard of the SnowDogg® SuperFlex™ into various positions. This makes it ideal for urban and expressway use. April 11, 2019 – Target Specialty Products, a leading value-added service provider of turf and ornamental solutions in the United States and Canada, has launched Turf Fuel G™ 24-0-11 Mini. The Turf Fuel G™ 24-0-11 Mini is exclusively co-branded with Scotts® PRO and is part of a broader line of fertilizers that leverage Scotts® PRO technologies. April 10, 2019 – Winter Equipment, a leading name in the municipal snow and ice management industry, offers its universal spinner that provides superior spreading of snow and ice treatments. April 5, 2019 – Husqvarna, a leading manufacturer of outdoor power products and lawn care equipment, has introduced several new products to the market to make lawn and garden work more productive and intuitive. April 3, 2019 – NDS, Inc., a leading provider of drainage and stormwater management solutions for both residential and commercial applications, has launched a new mobile app designed for contractors, civil engineers, landscape architects, and DIY homeowners. The “Stormwater Drainage Tools” app simply and quickly calculates stormwater runoff and determines requirements for implementing a variety of drainage solutions. April 1, 2019 – DeWalt has announced the six-tool Atomic™ compact series of tools that are lightweight and optimized for use in tight spaces. Part of the 20V Max® System, they will be available throughout 2019 and 2020. March 14, 2019 – Fecon has introduced the Tier-4-compliant FTX150 mulching tractor, delivering 150 net horsepower for performance in a versatile, fuel-efficient, compact design. March 14, 2019 – John Deere Golf has added two new E-Cut™ hybrid fairway mowers to its 6000A Series: the 6080A and 6500A. 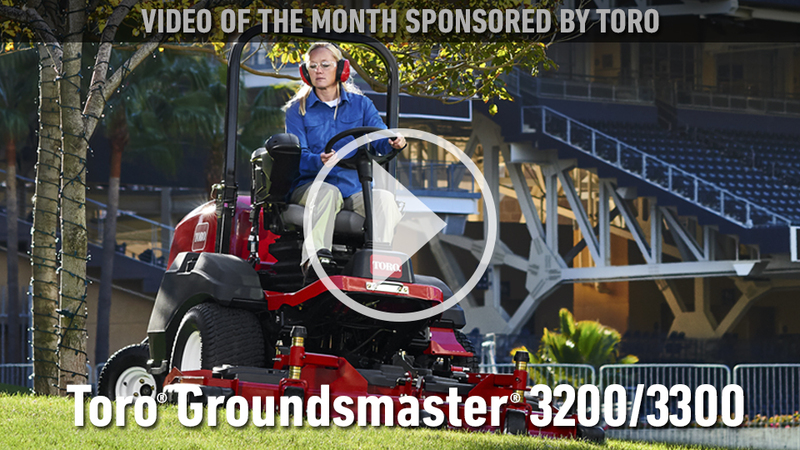 March 14, 2019 – Toro has launched its new Greensmaster® 1000 Series fixed-head walk greens mowers, designed to eliminate variability in the walk mowing process by integrating operators of all sizes and skill levels to work in harmony with the machine. Feb. 26, 2019 – Dog owners in Canada looking to train their puppies or keep them warm inside when nature calls, have a natural turf solution available to them. Sourced from Ontario turfgrass growers, Pooch Patch is vet-recommended and is an eco-friendly fix for a dog's natural needs. Feb. 25, 2019 – A robotic mower equipped with all-wheel drive and smart home connectivity has been released by Husqvarna. The AI-enabled machine can climb slopes with inclines as much as 70 per cent. Feb. 6, 2019 – Kubota Canada Ltd. has unveiled its lightest and most maneuverable compact track loader to date. The SVL65-2 is positioned in a lighter rated operating capacity weight class than previous models in the series.